It seems like since the day I became a mom almost 14 years ago and 3 kids later I have been on the search for the perfect stroller. I have always like the convenience of an umbrella stroller and tried many of them only to be unhappy and find myself missing some of the features of the full sized strollers. With each of my boys I bought a full size stroller only to find they would take up to much room in the c ar, way too heavy and hard to move around in a crowds. I recently received the Inglesina Swift stroller , Well finally my search is over !!!!! This stroller is exactly what I was looking for. 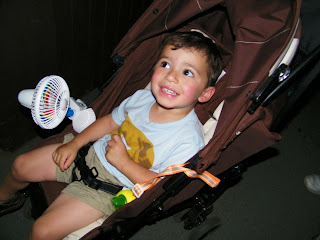 We went to the Zoo for Mothers Day and really got to give the stroller a good test ! It did not take up much room in the car, same space as most umbrella strollers. When we got it out of the car it unfolds very easy and has a great basket that held the diaper bag fine. It has soft touch handles that are positioned to make steering easy and pushing the stroller very comfortable. Here in the South it is very HOT and the canopy on a stroller is very important, this stroller has a great size canopy that will lock open !! On the canopy it has a large zipper pocket on the back that is great for your phone,keys etc. .After a few hours at the Zoo Bryce went to sleep and I was impressed on how easy the seat reclined and that it did not wake him up in the process. After a long day at the very over crowed Zoo I am very pleased with the Inglesina Swift stroller !! Compact for ease of use and ease of storage. Backrest reclining in 4 positions. Adjustable safety belts with 5 anchoring points. New textile design for the seat and hood. Standard canopy totally waterproof and removable, adjustable with practical open/close compasses. Equipped with a safety hook to avoid accidental opening of the stroller once it is stored. Spacious basket for objects easy to remove, homologated up to 6.5 lbs. weight. A Inglesina Swift Stroller !! Winner has been emailed, please reply within 48 hours. The Fast (seat)looks incredibly useful! I like the Zuma highchair in black. Thanks for the chance. I love the Zuma highchair because of it's simple and sleek design and it's easy manageability. added your button to the scroll on the right side of my blog. added you to my blogroll on the left hand side of my blog near the bottom. Wow, I found their website to be incredibly frustrating to navigate. Maybe because I don't have a fancy enough computer, I don't know... The only product I looked at was the Classica Pram. It seemed nice enough. I tried to look at other stuff but I just had a hard time getting the pages to load or finding things to click on. I LOVE the Inglesina PRAM... It is so Elegant and reminds me of when I was growing up! It is just so beautiful! That is the Kind of Baby Carriage that you fantasize about! It is OUT OF THIS WORLD!!! I adore it! I have your Button on my Blog.. as Always!!! YAY! Leslie Mayorga is already a Facebook fan! I like the Zuma High Chair! Very cool! I'm all about lightweight strollers and this one looks great! I also like their Fast seat that hooks on the table. The Zuma high chair looks awesome! I love the Zuma high chair - the colors are great! I really like their Club High Chair, but I didn't see it on their website. Maybe it's old? Their website was really difficult to navigate through and really slow. I would love the Zuma highchair! The Inglesina PRAM is beautiful! I love the Zuma high chair, I'd want it in red. I also like the Zuma. Zuma highchair in black, it's really nice. Thank you for the great giveaway! I think the Loft rocking chair is pretty neat. The orange color is cool! Wow, the Inglesina Zuma high chair looks really modern and compact! I love the Classica Pram! Their website is VERY slow. Had to go to their Flickr account to see the products. I love the CLASSICA AZZ pram with the pale blue top. That is gorgeous and classic. The Zippy is ultra kewl! Looks like it would be awesome for long walks with the newborn! I love the stroller in brown! I also love the Zuma high chair - it's super cool! I love the Classica Pram. I would have absolutely loved this when my little ones were just babies. It is beautiful. i love the zuma highchair. I would love to get my daughter one of the Zuma highchairs. The FAST chair that clips onto the edge of the table would be great. I also like the ZUNA high chair. I left a comment on Hippe Rehab!!! Thanks! In addition to the stroller, love the Zuma high chair. I also like the zuma high chair in red! I just became a subscriber! I posted on your Kodak easy share giveaway! I posted on your zosephine diaper bag giveaway. I posted on your crane humidifier giveaway. I posted on your douglas plush toy giveaway. I posted on your keyright giveaway. I posted on your hotel for dogs giveaway. I posted on your bagettes giveaway. I posted on your o yikes giveaway. I posted on your uneaks giveaway. I posted on your pop chips giveaway. I posted on your nifini giveaway. May 13, 2009 at 3:24 PM This comment has been removed by the author. I liked the seat for "siiting st the table withe the grownups". The Zuma is really cool! My comp is slow tonite. I'm also playing The Monkees on myspace so that is probably why - so therefore the Zuma highchair is the only page that could load but the highchair is really nice! I love the Zuma highchair! There are so many wonderful products offered at Inglesina's website and the Zuma Highchair is an item I would love to have for our daughter. It looks super comfortable for her to be in and it also looks easy to keep clean which is also important! Thanks so much for the chance to enter. I am Subscribed to Life In A House Of Blue via e-mail. I like the Loft Rocking Chair in graphite. I became a Facebook fan (My name is Missy Jones). Thank you! I love the Zuma highchair! Looks so comfy. I LOVE the Zuma!!! I've been looking for a really cool high chair that fits with our modern decor and that is a really great one. Thanks for the giveaway!